biomarkers – What is Nanomedicine? For me, nanomaterials is most exciting material type under research today – mainly because there is a whole area of interesting physics phenomena that occur for materials at the nanoscale. Optical, electrical, physical and chemical properties can differ for bulk and nano-sized materials due to spatial confinement. At the nanoscale electromagnetic forces dominate over gravitational forces, quantum mechanics must be used to describe energy and motion, the molecular motion becomes relevant and there is a greater surface to volume ratio. So, what is so special about nanotechnology? Firstly, what makes nanomaterials so useful is simply the size of the material. As I previously discussed in my Using Nanotechnology to Destroy Cancer post, nanomaterials are incomprehensibly small in size. Considering the fact that DNA is typically 2 nanometers in size and through using nanoparticles – we can readily interact with such biomaterials. This, of course, is why nanomedicine has such huge potential in medicine. Instead of using conventional medicine, we could potentially use nanomedicine which is much more targeted toward the tissue which requires the medication. There also exists many uses of nanotechnology as nanosensors in medicine but outside of the body particularly for diagnostics. Typically, in these applications, some sort of bodily fluid (blood/saliva/urine) which would exhibit certain biomarkers in the case of disease would be mixed with specific nanosensors which are highly sensitive to the specific biomarkers. This enables highly accurate diagnosis without the need for risky biopsies. A great paper which discusses these diagnostic devices is High-sensitivity nanosensors for biomarker detection by Swierczewska et. al.. Asides from in the medical field, the small size of nanoparticles is highly useful for applications like nano-based batteries and artificial photosynthesis. Next, let us discuss the surface to volume ratio. So, let us say that we have a cube with side length of 4cm, the total area of the 6 faces of the cube is 96cm². Now if we divide this same cube into 8 cubes – keeping the same volume – each cube would have a side length of 2cm. 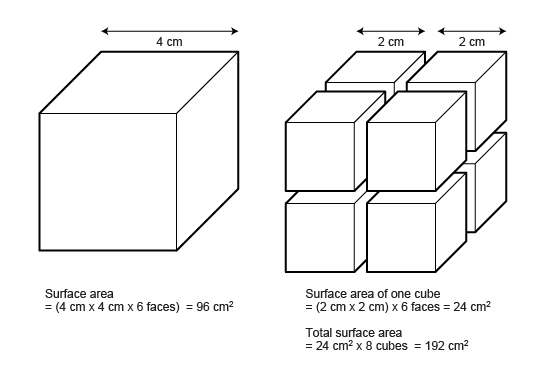 Doing the same math, we get a surface area of 24cm² per cube, or for the total surface area of the 8 cubes, we get 192cm². Therefore, with the exact same volume of cube material, dividing this cube into many small cubes increases the total surface area. Now imagine that instead of splitting this cube into 8 cubes, we split into nano sized cubes. The surface area would be increased very significantly. More surface area = more atoms at the surface and less nonreactive inner atoms = improved reactivity at the nanoscale -> nanomaterials make great catalysts. Also, with this increase in surface area – we have more room on the surface to add functionality, for example, targeting moieties. This high surface to volume ratio also makes nanomaterials ideal for catalysis.